this software download contains all the files you need to unlock and root your device, or flash it back to stock and re-lock it. You can also use this program to backup all your user apps, system apps, and app data, and easily restore them later in one click; you can flash or boot any IMG files you want to any partition on your device; as well as flash any current or future stock android release, making updating your device as easy as can be; and now with the latest release (v1.3) you can configure your drivers automatically. This program should work with providers around the world including Vodafone, Telus, T-Mobile, Bell Mobility and other GSM providers offering the Samsung Galaxy Nexus. Version 2.1.9 is a freeware program which does not have restrictions and it's free so it doesn't cost anything. 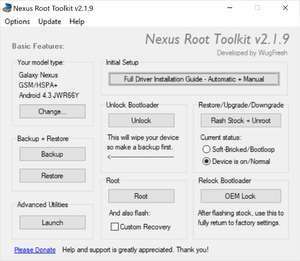 For security reasons, you should also check out the Nexus Root Toolkit download at LO4D.com which includes virus and malware tests. Additional screenshots of this application download may be available, too. Samsung Galaxy Nexus Root Toolkit has a presence on social networks.